BEING a manager in the engineering and planning department of the Maritime and Port Authority of Singapore (MPA) has its perks, as Ms Cheong Yiting has discovered. It allows her to go island-hopping round Singapore's southern islands, which few people get to do and is something she enjoys. She explains that a large part of her job - managing projects related to the development of Singapore's ports - involves what is called pre-development work. This includes studying projected traffic and pollution. For her current main project, on the upcoming Tuas terminal, she and her team are doing studies to ensure the port's facilities meet future needs, such as the right container handling capacity. Environmental studies for the terminal - expected to be ready within a decade - have allowed her to visit offshore islands. 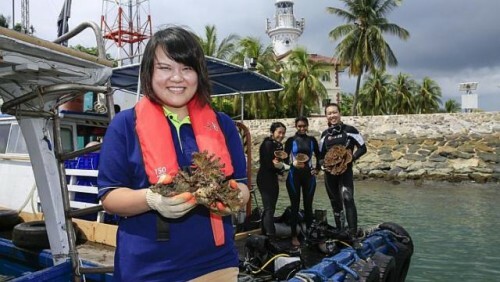 Ms Cheong, who joined MPA two years ago, visits these islands as part of her project involving relocating corals that may be affected by the development work in the area. "I have been to the big islands like Sentosa and Ubin but this job has taken me to Sisters', Saint John's and Lazarus islands, which I previously didn't know about," says the 31-year-old. "I also enjoy meeting the people from the nature societies we work with, seeing how passionate and determined they are to preserve the environment." Another exciting aspect of her job is being part of the support team for search and rescue operations and oil spills. Using software designed in-house for the MPA, she and her team input information, such as where a boat was last seen, to obtain its projected location after a specific time lapse. Although this aspect of her work involves being on 24-hour standby for a period of two months at a time, she says incidents are rare. Her main challenge is working with different people from various organisations, agencies and backgrounds for the Tuas terminal development. She says: "I try to accommodate their requests, to consider everyone's concerns and see things from their perspective. "This requires flexibility. If I cannot accommodate the request fully, I try to meet them halfway. "If even that is not possible, I'll have to explain to them why it's not achievable."